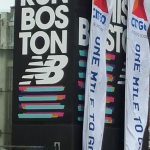 I had been looking at that Citgo sign for miles and as I finally approached it, signaling one mile to go on the course, I started to choke up just a little. “Less than one mile to Boylston street – almost back” I thought to myself. Luckily the tears were hidden behind my sunglasses and my legs, now running on adrenaline, barely felt anything that last mile. 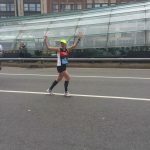 And as I made the famous left turn onto Boylston, I saw the finish line come into view off in the distance… I slowed down, took a deep breath, and wiped the tears as I began to take it ALL in. I looked side to side observing the storefronts, listening to the deafening crowds, observing the hand-written signs, and noting the crisp white memorial flowers. 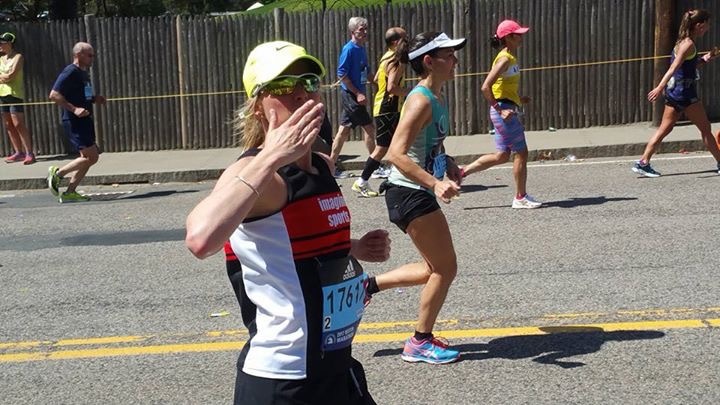 I closed my eyes, took a few deep breathes and jogged my way to a second finish of the Boston marathon. I stepped over that line, threw both hands up giving thanks to God, my family, my friends and all those who supported me in this journey back. “Running hurts everyone, but it’s how you deal wth that hurt that builds and shapes your character” – Kara Goucher. 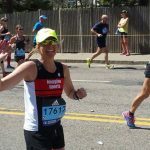 The Boston course will break many runners on the backend, which is where all the work is, so I knew what I had coming as I envisioned the Newton Hills and the infamous Heartbreak up ahead. I started to pump the breaks and stayed around 8:30’s which still felt challenging. Sigh. We had a tailwind (or so they say 🙂 ) but we were running in such tight packs all I could feel was the sun beating down and the body heat of other runners surrounding me as we knocked elbows trying to propel ourselves forward. As we reached Wellesley, the halfway point, I could feel the ache in my legs starting to creep into my mind. It became a mental battle to the finish for the next thirteen miles. I kept telling myself, “four miles until family” where I knew Paul, Jenn, Chad, Dustin and my in-laws would be perched up at mile 17 to give me a boost, and I really needed it. By this point Jennifer Ryan and I had been running the entire race together and our conversations had gone quiet, we both were working hard to stay focused. 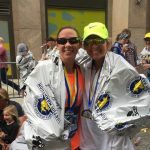 We also played mind games together, “Just an easy weekday run to go, right?” She would tell me…I smiled and just shook my head, “Sure!” My breathing had now become very labored as dehydration was setting in. I had my eyes peeled looking for Paul and his Dad (both tall) for the entire 16-17 mile markers. When I saw them my energy level literally spiked with cheers of “that’s our Jules!” 🙂 The whole crew gave me a lift for the next few miles through the hills of Newton. Its when I needed them the most, and they knew it- I’m so glad they were there! I kept telling myself, just get through Heartbreak and it’s downhill from there (because it literally is for the most part!) and I kept my head down and cranked away. By mile 20 the hills did a number on many of the runners and folks were starting to walk the hills or walk in general. I had to weave to keep my cadence and keep moving forward. My knees, my hips and especially my quads from the downhills were screaming. I started to dream of a 64oz Gatorade as I couldn’t get down enough fluids at each aid station, I was so dehydrated!! The base salt was just sticking to my throat causing me to gag and cough, but I still shoveled it in. This salt is a life saver – I believe it is what saved me yet again! “5k to finish, 5k to finish” I repeat to myself and I look down at my watch to learn my day is not what I wanted – at all. But I reflect back to what my coach told me, “no matter what, leave it all on the course” And with that, I decided to do just that. I picked up my cadence and pulled out the last few miles sub-eight. I put it all out there, no regrets. And while this was not a PR or another BQ, I gave it all I had that day and I am not disappointed in the least. 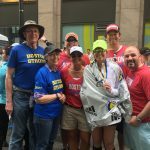 The city of Boston welcomes and celebrates runners in a way no city in the world does, and I was so happy to be back to experience the magic that is Boston, full circle this time with my best friend and family. I’m proud of what I put down that day because I ran with all my heart. And at the end of the day, that’s what it’s all about! I thank God for this opportunity, this gift and this life – I feel so blessed. I have faith everyone who wants to run the streets of Boston can hit the mark. I was a doubter before too… DREAM BIG! always a good read…keep it up.